Kota Kinabalu (Agenzia Fides) - The Christian communities in Malaysia, also the Catholic Church, renew their commitment in the field of education, to teach the Christian virtues of discipline, diligence, charity, compassion and integrity. This is what emerged from a recent seminar that involved delegates, managers, priests, teachers, Christian educators and school administrators of the schools run by the Churches in Kota Kinabalu. "The role of missionary schools in the current school system", was the theme of the seminar held in the complex of All Saints Cathedral. 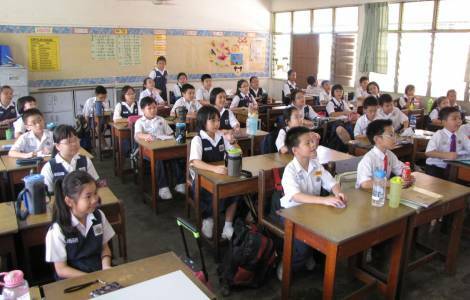 Altogether there are 100 missionary schools in the province of Sabah, about sixty run by various Protestant Christian denominations, and 43 Catholic schools. Archbishop John Wong, who is at the head of the Catholic Archdiocese of Kota Kinabalu, spoke at the Seminar. In welcoming the delegates, the Protestant Bishop Datuk Melter Tais, president of the Council of the Christian Schools of Sabah, declared: "Missionary schools are our inheritance and are a mission entrusted to us by God". The leader recalled the Education Forum 2017, where various resolutions were adopted to claim the ethos, character and traditions of the schools run by the Churches. The first objective is to "make God present" in Christian schools, then to strengthen the faith of young generations through the knowledge of the Bible, and finally to promote the holistic development of students who attend missionary schools. The president noted that the educational landscape of the country has changed over time, due to various policies implemented by the government. Today there is a need to revisit the role of Christian schools in the context of the current school system. The fundamental report, entitled "Educational development and education policies in Malaysia and their impact on mission schools" was offered by Moey Yoke Lai, president of the Federation of Christian Missionary School Councils of Malaysia, who oversees the 437 mission schools existing in the country. The president said she is convinced that mission schools have an important role in the current school system: the emphasis on "holistic education" and the founding principles such as education for all, compassion for the poor and the weak, personal education, discipline, passion and perseverance, are precursors of national educational policies. "We are called to an education that makes the person grow as a whole. We have to teach children the joys of learning, the respect and appreciation of the beauty of God. It is our task to show students the Christian virtues of discipline, diligence, charity, compassion and integrity", Moey told Fides. With a Malaysian population of 10.5 million young people between the ages of 1 and 19, the workshop also pointed out the need to make Christian schools a field of mission of evangelization.